I've had a bit of down time between contracts recently and have been taking the opportunity to learn some technologies that I haven't had time to get into before. Since I've read so much about it, I thought I would try out ASP.Net MVC. Since it was just for fun, I figured I'd bite the bullet and try it under VS 2010. I build a small sample following the tutorials at http://www.asp.net/learn/mvc/, however when I try to run it in VS 2010, the app crashes on me. There's enough "Magic" going on inside MVC, including the routing engine and dynamic loading of the controllers and views that trying to debug MVC is challenging enough when the IDE behaves. When it doesn't it makes life significantly more problematic. Naturally VS hard crashes rather than breaking in my code to let me figure out what's going wrong. It turns out there wasn't a problem in my code, but rather an issue with MVC and the Historical Debugger which is turned on by default in VS 2010. 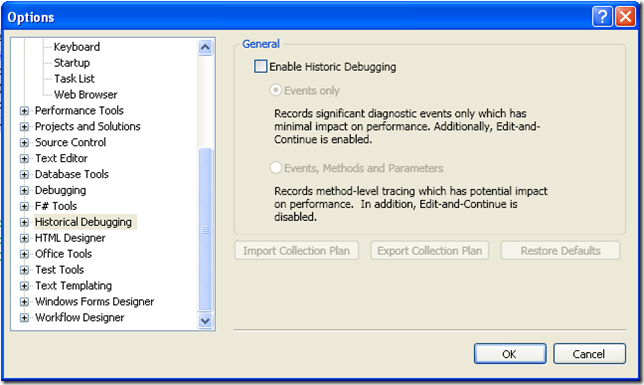 To fix the issue, open the Option dialog (under Tools - Options) and locate the Historical Debugger tab. 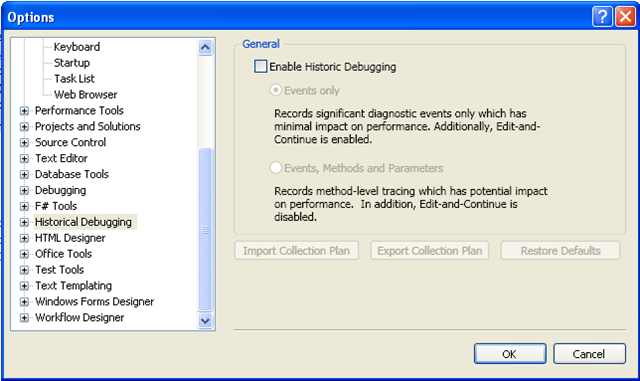 Uncheck the "Enable Historic Debugging" option. Joe Cartano of the ASP team assures us that this will be fixed in Beta 2, so hopefully this is only a temporary situation. Maybe next time I'll remember to read the release notes completely before banging my head against the wall.